Tag line: "HORROR to make you GASP!" 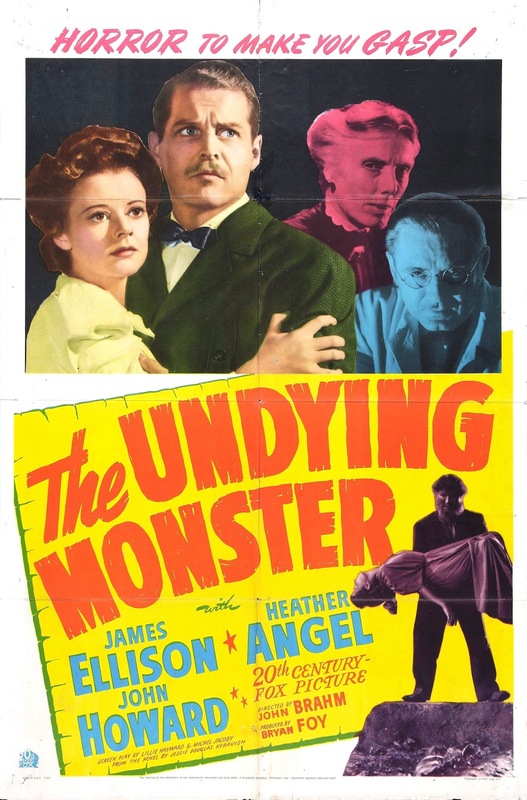 The Undying Monster, a 1942 horror/mystery released by 20th Century Fox, is a scant 63 minutes long. But its director, John Brahm, makes excellent use of each and every one of those minutes, spinning a tale that's visually vibrant, and with plenty of atmosphere to boot. The story concerns the Hammonds, a well-respected British family that, for centuries, has been living under a curse. Legend has it an immortal monster, supposedly an ancient ancestor of the Hammonds, roams the land surrounding their vast estate, murdering anyone foolish enough to wander out on a chilly, moon-lit night. Helga Hammond (Heather Angel) is convinced this curse is a myth, and when her brother, Oliver (John Howard) and a neighbor girl named Kate O'Malley (Virginia Traxler) are attacked one evening by an unknown assailant, she goes straight to the authorities. Enlisting the help of Robert Curtis (James Ellison), a scientist working for Scotland Yard, Helga hopes to prove there was nothing supernatural about the attacks, yet as both she and Mr. Curtis will soon discover, there are things even science can't explain. Thanks to some well-placed shadows and creative camera angles, director Brahm establishes the film's forbidding ambiance in the very first scene. Late at night, Helga is talking with Walton (Halliwell Hobbes), the family butler, who fully believes the curse is real. Standing with her in a dimly-lit room, he recites a poem that's been passed down for generations: “ When the stars are bright on a frosty night, beware thy bane on the rocky lane”. Sure enough, the two hear what sounds like a wolf howling just outside the door, and when Helga investigates, she finds Oliver lying unconscious, and Kate O'Malley, beaten and bruised, at the bottom of a crevice. From there, the movie shifts gears a bit, transforming into a police procedural as Curtis and his assistant, Ms. Christy (Heather Thatcher), carry out their investigation (including a tour of an eerie family crypt). But rest assured, we haven't seen the last of the so-called “Hammond Curse”. With its tales of creatures and curses, set against the backdrop of an ominous manor situated high on top of a hill, The Undying Monster rivals some of the best of what Universal Studios was turning out in the early 1930s, when movies like Dracula, Frankenstein, and The Mummy were setting the standard by which most later horror films would be measured. The Undying Monster more than measures up to these classics; it stands beside them, taking its place among the elite of the genre.